Ever crave peanut butter but is worried about all the calories and fat? It can be real tempting to take a spoonful right out of the jar. Well, there’s a powdered peanut butter alternative. 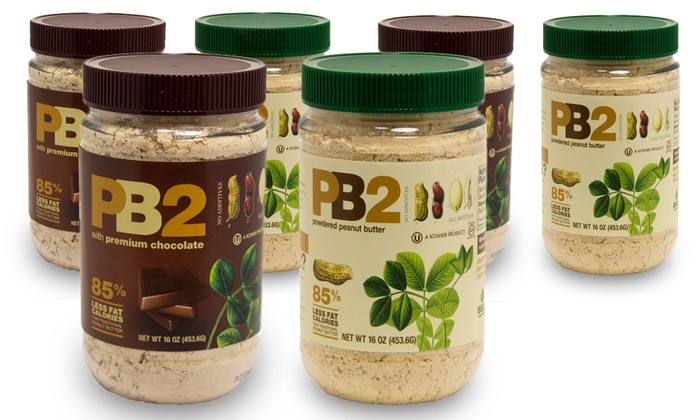 Bell Plantation makes a product called PB2. It’s made from slow-roasted peanuts, but contains 85% fewer fat calories than traditional peanut butter. The fat and oil is reduced through a chemical free process, leaving behind a powder that can be reconstituted with water. PB2 can also be used in cooking and baking. Add it to smoothies. Sprinkle it on desserts. There’s quite a number of things you can do with it, but you can simply mixed it with water to create a smooth and creamy peanut butter mixture. Each 6.5 oz jar is approximately equivalent to an 18 ounce jar of regular peanut butter, depending on how it’s mixed. PB2 powdered peanut butter comes in regular peanut butter or peanut butter with chocolate. You’ll have to play around with the powder to water ratio, until you reach a nice creamy consistency you like. I’ve also had good success baking with it and using it to make peanut dipping sauces. A 6-Pack of 1 lb jars PB2 Powdered Peanut Butter for $39.99. Choose from peanut butter or peanut butter with chocolate. Bell Plantation also makes all natural, preservative-free peanut butter cracker. A 12-Pack of 7 oz bags of their PB Thins Peanut Butter Crackers is available for $29.99. In additional, each deal also comes with a 5% Back in Groupon Bucks.